Exercising the lat muscles gives your back a broader, more defined shape. There are two common types of exercises incorporating the lats: those in which you work the weight perpendicular to your body, like rows, and those in which you work the weight vertically in line with your body, like lat pulldowns. Rows can be done with dumbbells and are extremely effective in strengthening and building the latissimus dorsi. The latissimus dorsi, more commonly known as the "lats," is the largest and broadest of the three main back muscles. It makes up the triangle from your hips to your shoulders. These muscles lie across the middle section of your back on each side. When they are trained, they cause the desired V-shape effect that helps make the waist appear smaller. Stand beside a flat bench and kneel on it with your right knee and right hand resting on the bench. Pick up the dumbbell from the floor with your left hand in an overhand grip. Pull the dumbbell up to your side until it touches your ribs or until your upper arm is just beyond horizontal. Extend your arm down toward the floor until it is almost straight to complete one rep. Do two sets of 12 to 15 reps. This compound exercise targets the entire back and uses the latissimus dorsi as synergist muscles -- along with the trapezius, rhomboids, posterior deltoids and pectoralis major. Lie face-down on an elevated bench and position the dumbbells so they are beneath the bench. Keep your legs straight so that your toes rest on the floor. Grab the dumbbells in an overhand grip and pull them up to your sides until your upper arm is just above horizontal. Return the weights toward the floor until your arms are straight and your shoulders are stretched downwards. This completes one rep. Do two sets of 12 to 15 reps. This exercise also targets the entire back and uses the lats as synergist muscles -- along with the trapezius, rhomboids, posterior deltoids and pectoralis major. If you are just starting out, begin with a light weight. Choose a weight that offers a challenge but is not so heavy that you cannot complete the set in proper form. 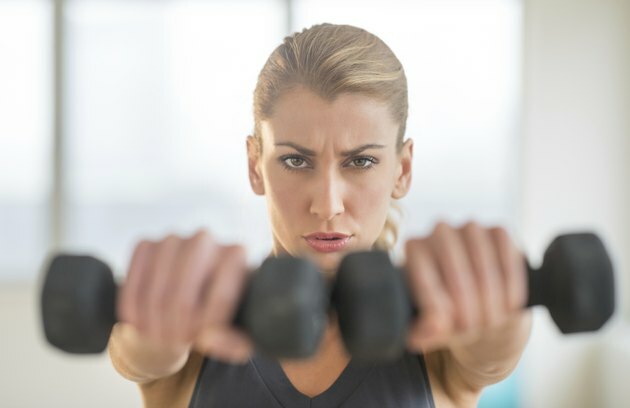 Make sure you speak to your doctor before you begin a new weight-training program, particularly if you have any pre-existing injuries or health concerns. If you experience pain at any time during exercise, stop immediately and seek medical attention.